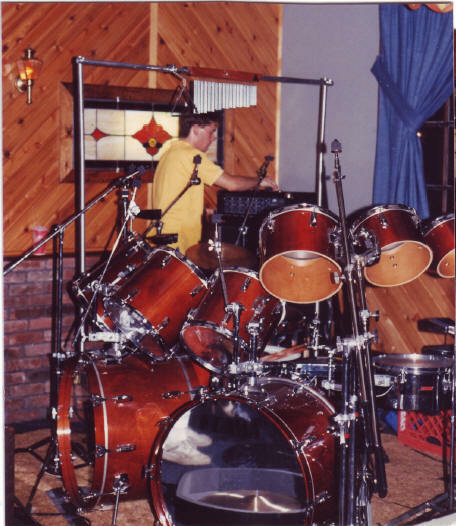 One of the defining themes in Neil Peart's drumming and drum setup is change. 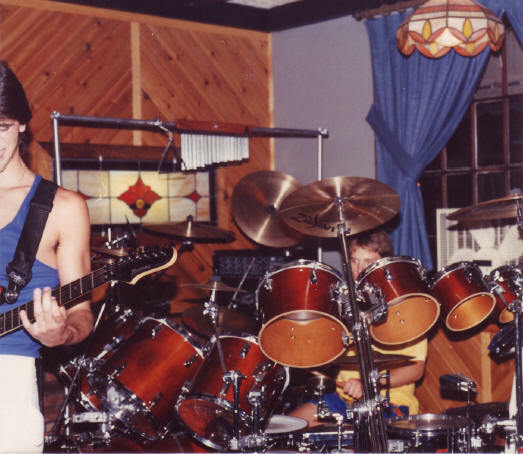 He's always been searching for new ways to approach the drums and new ways to set them up — whether it's replacing a timbale with a floor tom on his left side or adding a satellite electronic kit. ROTO TOMS - The roto-toms have been restored to their original black color by Premier Painting Service, which was done in layers of flat black with a satin finish and a nearly indestructable clear-coat to protect the finish. SIMMONS DRUMS - In conrast with previous iterations of my Peart-influenced kit (which included Roland drum pads), the 'Simmons-side' of my Peart-kit now features mint condition vintage SDS-9 pads, complimented by the Gtr.Center version of Simmons pads and Dauz 6" pads. One special addition (my 'Sidney' trigger) is a modified 3.5" diameter trigger by the UK company Koby. The electronic drum pads, and the acoustic bass drum trigger, are now patched into a new Roland TD-6V, amplified by two 15" cabinets & subwoofer. SNARE DRUM: Brass Pork Pie, a tight articulate snare. BASS PEDALS/HI-HAT: Limited Edition Tama Iron Cobra ALL CHROME...holy sweetness! Re-placed the 6” roto-tom with an octoban; replaced the suspended floor tom to my left with a Roland SPD-S sampling pad; added two 6” Dauz e-pads (fed by the SPD-S with effect-sounds for acoustic-hybrid play)), integrated a semi-melodic ‘cowbell tree’, and added another 8” splash (above the 10” roto-tom). Also picked up a super-sweet Pearl gold ‘Degrasso’ snare. The images give you a full-circle view of the latest permutation of the ‘Rorke-kit’. This is a kit in the round with a near bifurcation between the electronic and acoustic drums, so in that way retro-typical in its Peart influence. 6”, 8”, 10”, 12”, 12”, 14”, 16”, and 18” reconditioned roto-toms mounted by their threaded rods, each positioned via a ratchet arm (allowing for full-articulation in mounting; a big improvement over the ‘track-mount’). The second 12” roto-tom is tuned lower than the first, providing a fluid transition from the ‘concert-tom’ like layout of the 6” - 12” roto’s above the hit-hat(s), octobans, and timbales. The bass drum is a 22” Sonor, and the 18” floor tom (replacing my Gong Bass drum from the 2007 kit) is a matching basswood Sonor as well (a rare find), tuned to a thud in order to render the mounted gong-bass redundant. 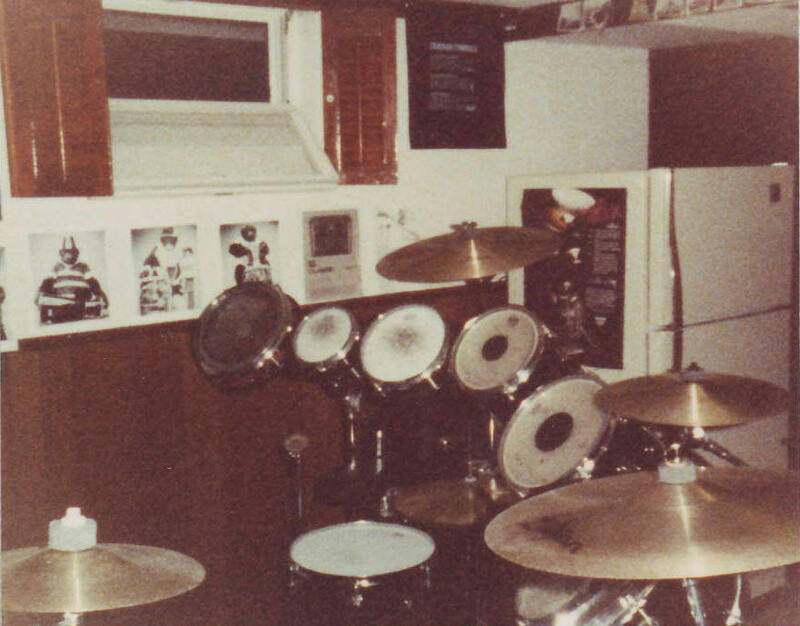 I needed the room for the Roland electronic kit behind me, so the Tama gong-bass had to go. Also included is a scaled down set of cowbells to approximate Neil’s, using agogo bells and rock bells, with an actual regulation fire-bell added (imagine the sound of an ice bell, but all attack, no ring with a quick decay). These are located between the bass-drum mounted 16” medium thin crash and the 8” splash. The crotale and ice bell remain. 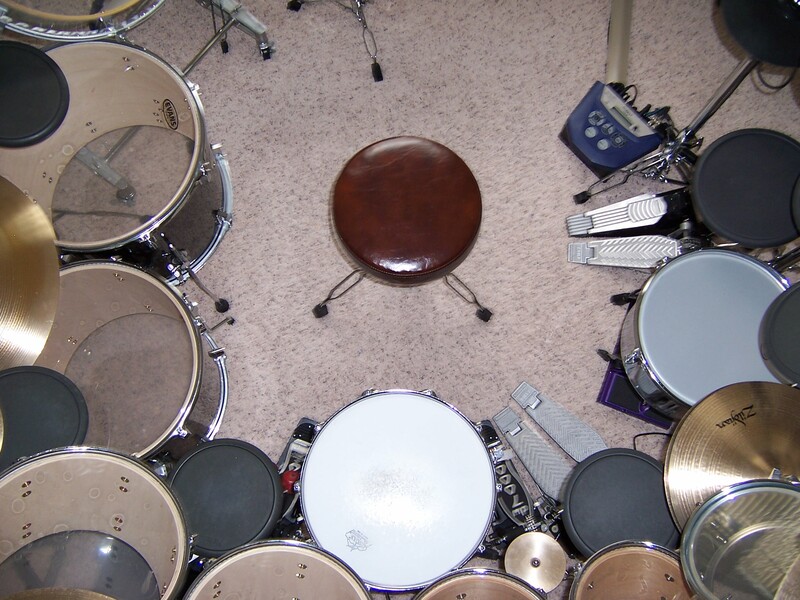 Regarding the placement of cowbells, as inspired by Professor Peart, to my left I have opted for the addition of a more contemporary Peart-bells set-up and placement, just past a unique high-toms configuration. Also in that area is a stick-triggered mounted metal vibra-slap. Below and adjacent to the high roto’s, just to the left of my 13” timbale, I positioned 6” and 8” timbale drums with 14 and 16” deep 6” diameter octobans. 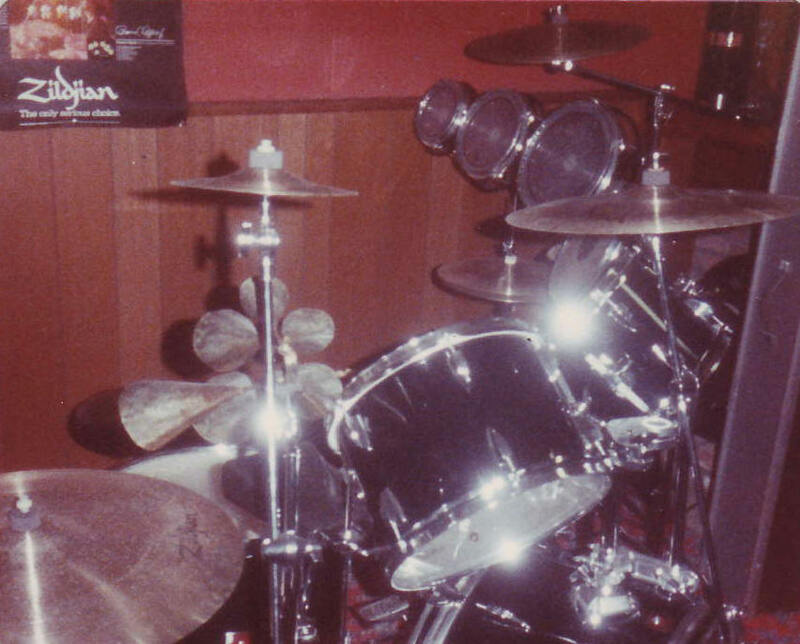 The acoustic kit [front] uses DW double-bass pedals, a vintage Tama hi-hat, and a Roland bass-drum trigger. The electronic kit [back] uses a Roland e-hat pedal, a Tama hi-hat stand and a Pearl series double bass pedal. Specifically about snare drums, the front kit includes a Ludwig brass tuned tight (for a nearly drum corps staccato attack), while the back kit has a Ludwig Rocker tuned lower for a fatter sound (still the best sounding snare for the money) positioned near the Roland 11” dual zone snare pad. Both acoustic snare drums are level to the horizontal for precision in rim-shot attack. The hardware used varies, but worthy of noting are (1) the space-saving in-line ride and crash stands (assembled from compatible vintage Slingerland, Rogers, and Premier parts); (2) the extension-clamping system to hold the legless hi-hat stand in position, (3) the space-saving baseless upper-assembly of stands clamping strategy for the two Chinas up front (for Bozzio-style riffing) and for the 12” splash up front; (4) the top-mounted 14” trash hats positioned above the 16” Wuhan to the right of the ride by way of a modified stock-section, clamp, and hat-mount; (5) the hi-toms set-up was made possible by clamping to clamps and truncating extensions; and finally, also worthy of a mention is that the Roland rack didn’t work for me, so (6) ball-and-socket tom stands, clamps, L-brackets, and ratchet arms were used to individually position the gum-rubber pads. Wires for the electronic Roland kit (i.e., the ‘reverse kit’) are sent to and bundled in a project box, designed to both hide the wires and provide a small platform for a midi-device to expand my effects sounds on the kit. The TD-6 brain is mounted so that the sound-scheme can be changed manually with ease (no need for a foot-switch or trigger, and it makes programming sounds and assigning sounds to pads a more comfortable task). The amplification system I use includes the Roland sub-woofer cube, and a 15” Roland synth-amp daisy-chained to a 12” Roland synth-amp. I augment my e-drums sound scheme by using a Digitech Vox300 effects pedal, with bypass feature. I advise this for anyone interested in a phase-effected e-snare, or fattening up the exceedingly thin e-hat sounds of the early Roland brains. Perhaps this is incidental, but for those wondering how I get behind the kit to play: There is a walk-way space between the Sabian 19” China and the octo’s of the acoustic kit that I sometimes close with a single matching Sonor 14” drum on a stand, making the kit ‘full-drums-in-the-round’. Also, this ‘spare’ 14” tom is useful for switching out with the 13” timbale when I need a floor tom stand-in to my left. It’s not quite a floor tom, but when tuned right, it gets the job done. The Roland kit has acoustic cymbals to make up for the challenges the older Roland brains offer in the way of cymbal pad sensitivity and limitation of cymbal sounds in the older brain. The bulk of the heads used on all the kits are Remo Pinstripes (clear) with the exception of Remo dots and clears on the octobons and small timbales, white-coated batter heads on the snares, Evans hydraulic on the bass drums, and a white-coated Attack head on the 13” timbale. I attempted the use of hydraulic heads on the roto’s, but only seemed well-suited for the extremes of tuning (most easily producing either a nice high resonance or a dark thud, but had difficulty creating the nuances necessary for the 8 roto’s). Lastly, I have kept Evans hydraulic clears on the auxiliary 14” tom, and the 18” floor tom tuned to a thud. 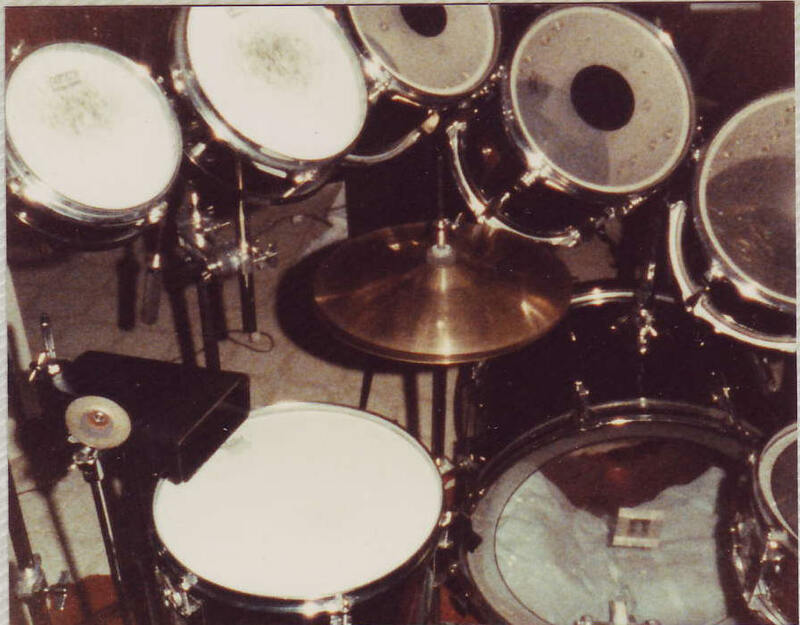 Plans to change the kit in 2009 include the addition of a Roland SPDS sampling multi-pad in place of the 16” roto-tom. This will extend the sample-triggering capabilities of the mostly acoustic front kit without the need to work-in individual pads to make the kit truly an integrated hybrid drum set that represents and sounds like my major drumming influences. I was inspired to add this kit to my studio after seeing Neil’s Buddy Rich Memorial concert performance, and wanted to meet the challenge of doing more with less — plus my son (yes, he is being trained in the ways of Professor Peart) required a kit with a tighter configuration. The smaller kit uses all Ludwig pedal hardware (double bass and hi-hat), and, unlike the larger hybrid electric-acoustic kit-in-the-round, has a wood-shell snare drum with a controlled sound dot head. Here are the kits S. Rorke from over the years. It's interesting to see the differences and simalarities. 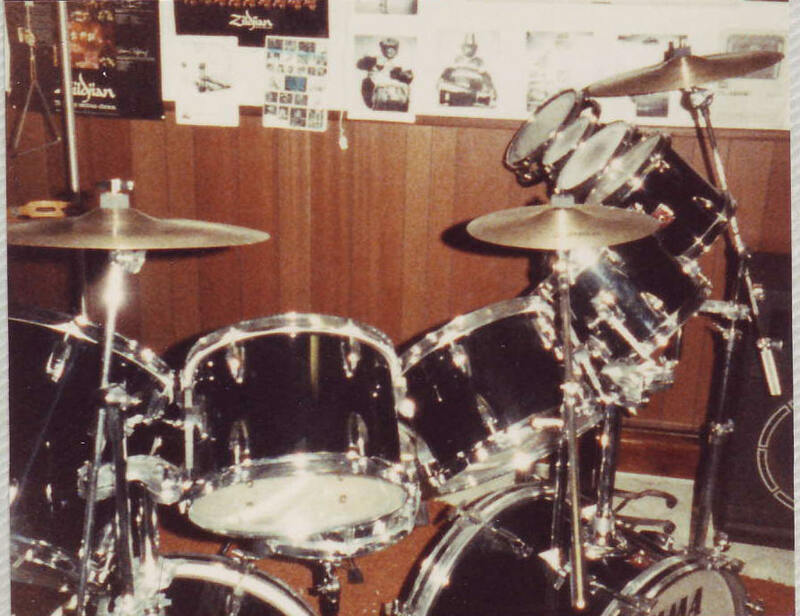 This is clearly the same kit as the 1987 kit (a Tama Artstar set, as I recall), but this picture is from 1989. Incidentally, as I mentioned in an earlier email my interest in hardware innovations, just such an original modification can be seen holding the 12” splash on the rim of the 12” double-headed tom. I used the mounting from an LP cowbell kit, had a rod manufactured to specs with the proper angle and a section lathed down to receive a vintage Slingerland cymbal topper, then topped it off with said topper. 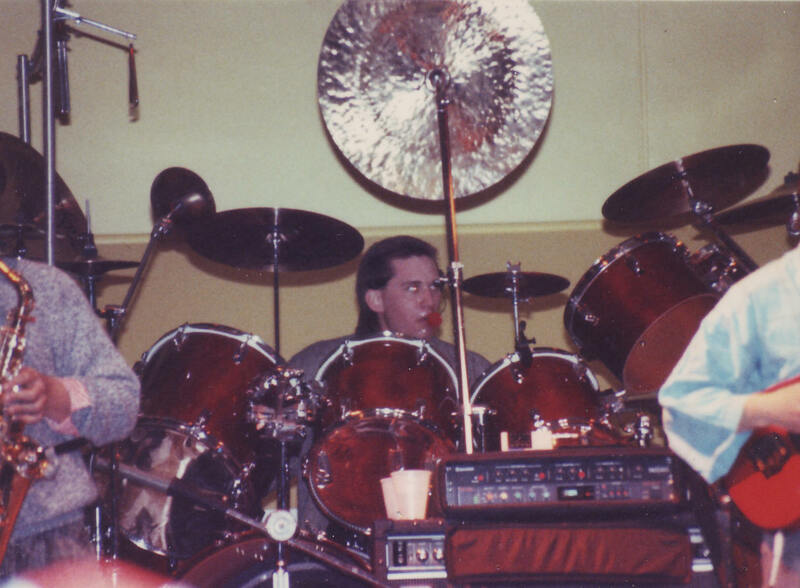 This picture is the earliest Neil-inspired kit-pics I have (from 1981), before my transition to double bass. Notice the crazy custom made bells! I remember having to custom order those and wait 2 months for delivery! 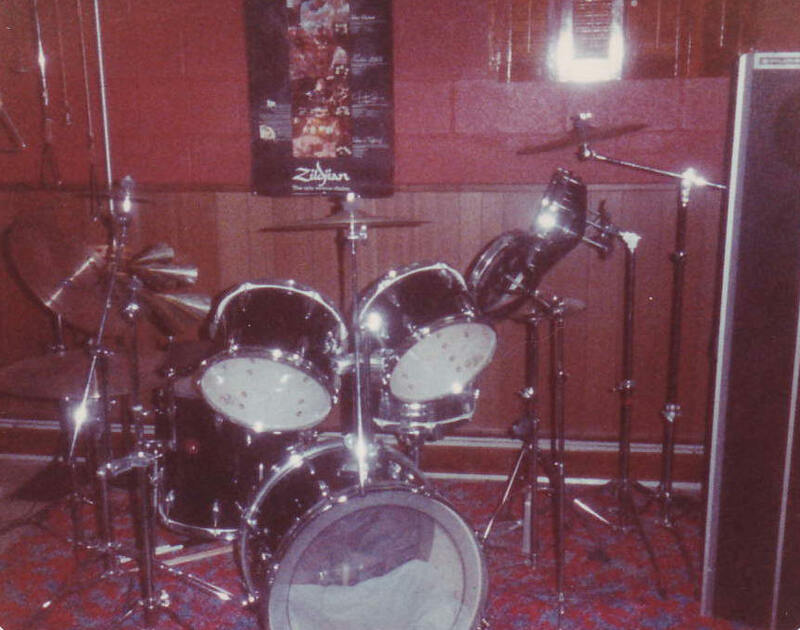 These next pictures are the same kit, but the 1982 iteration of a Moving Pictures inspired kit. 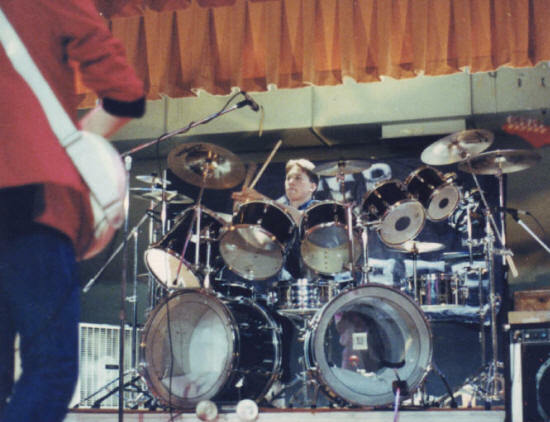 This is the first time I had “double-bass” drums in my kit, equally as modeled after the Neil Peart set configuration as my toms and cymbals at the time. 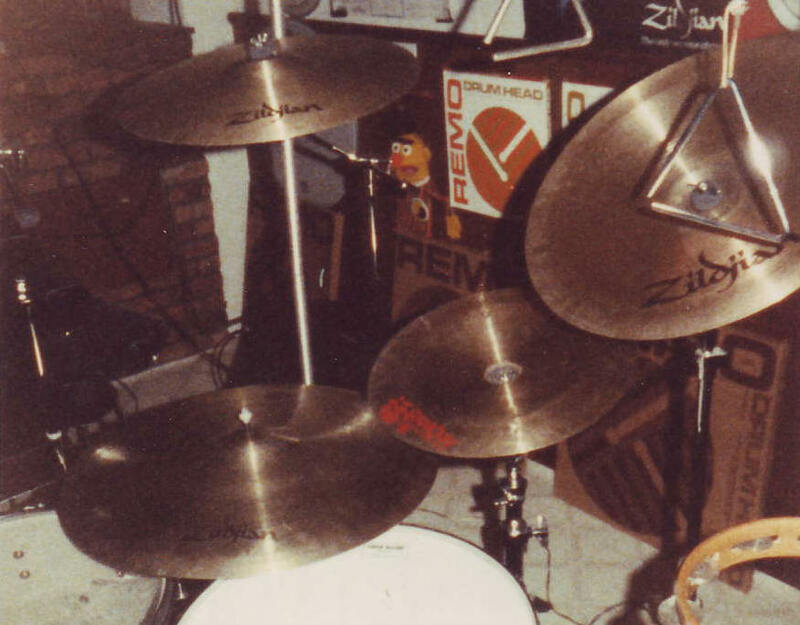 Notice the drilled-out for mounting Zildjian finger cymbal b/c I couldn’t afford a crotale! Also a major flashback: Look at the red lettering on that super-vintage Wuhan! I remember really having to go out of my way for that. That 16” Wuhan is still with me in the 2008 Sonor- Roto Tom- Roland kit! However, the red logo has long since been polished away.